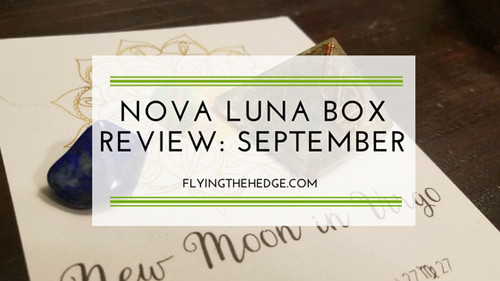 My final box of my Nova Luna subscription arrived a couple weeks ago with lots of awesome goodies tucked inside. 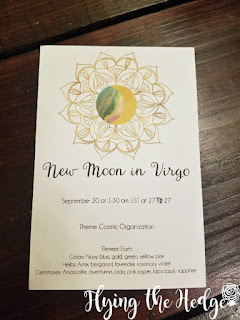 Upon opening the box, the first thing I noticed was the information sheet explaining the New Moon in Virgo. Unfortunately this one was not printed on nice card stock like last month's. 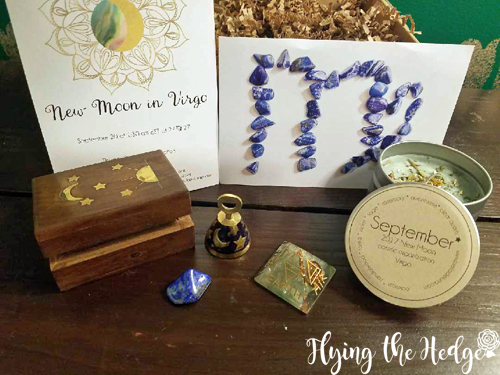 However, it contained all the same useful information, including a breakdown of the price, a bit about the crystals in the box, and a mantra for the New Moon. 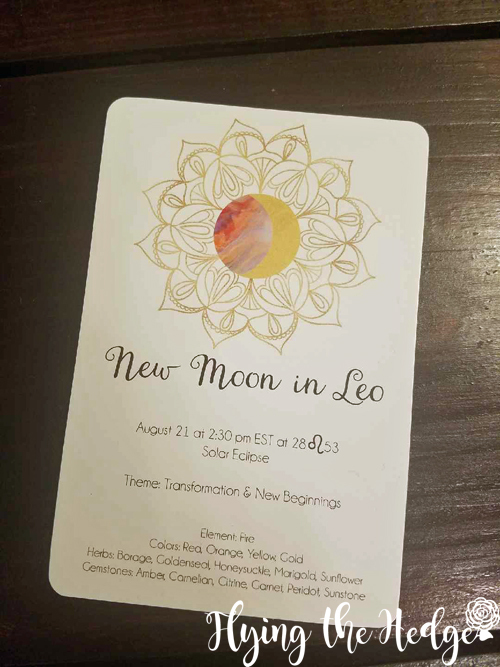 Under this card was a second one explaining the ritual for the New Moon. 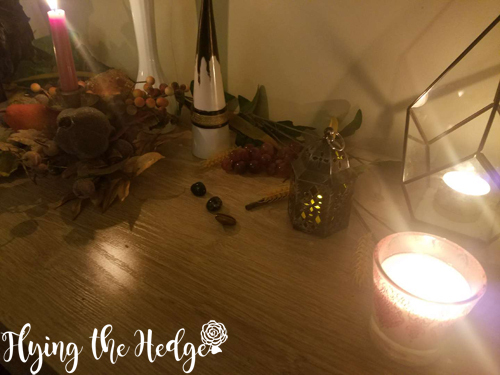 This gave some great advice on how to use many of the tools in the box, which is great for novice and advanced witches alike. Under the cards were a variety of items. 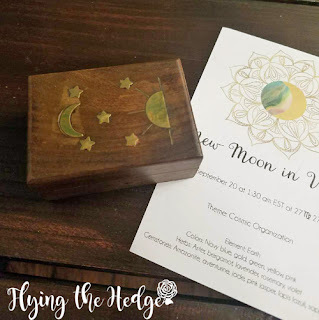 The first one I removed was a celestial box inlaid with brass. Inside was a lovely celestial bell. I like box as a safe place to store the bell, although it will fit a variety of small items. 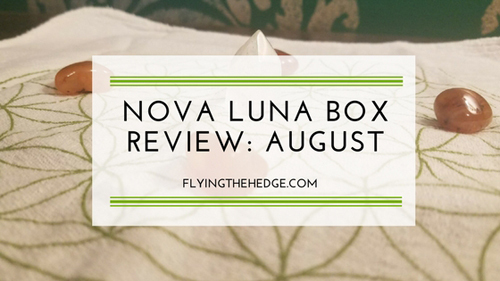 This box would be great for carrying small ritual items to work, school, or vacation. 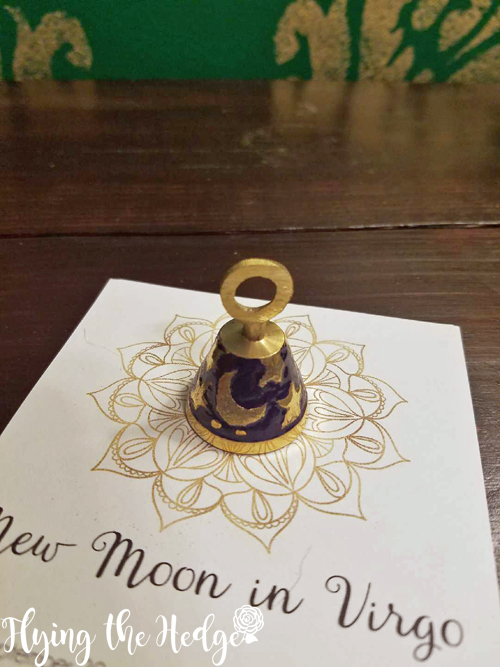 The bell is small, but produces a beautiful, loud ring, great for clearing spaces and signaling the beginning and end of a ritual. Next was the monthly New Moon candle. This one smells of oakmoss and sandalwood with slight undertones of tonka, violet, sage, and rosemary. Embedded in the candle is aventurine and clear quartz. 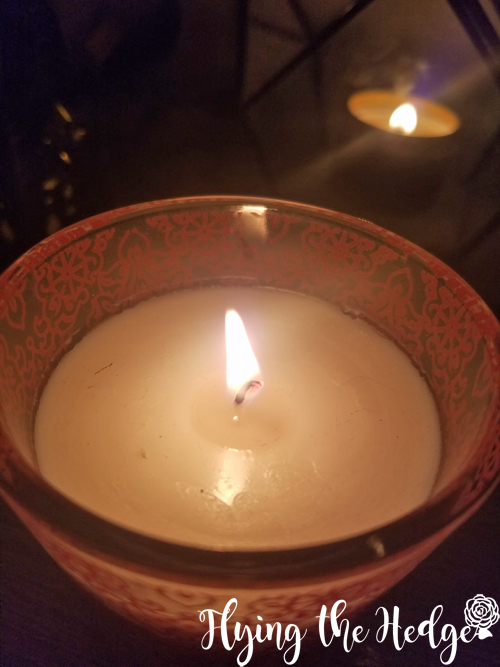 When burned, the candle smells similar to eucalyptus and is very relaxing. 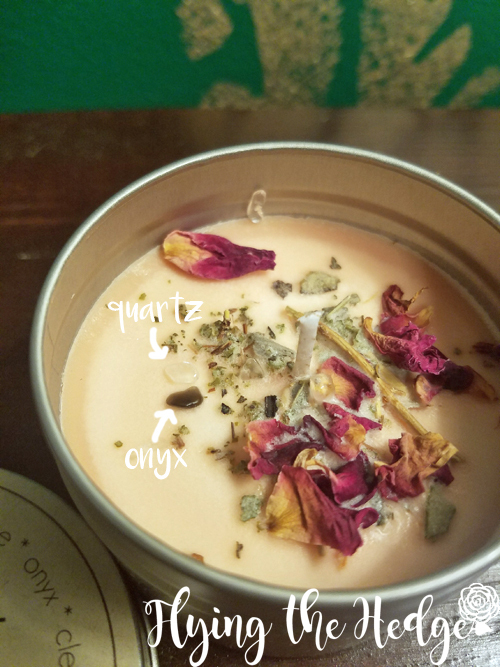 I burned this candle during my New Moon ritual which honestly took place entirely in the bathtub. Lazy, I know, but can you blame me for not wanting to get out of a warm bath? 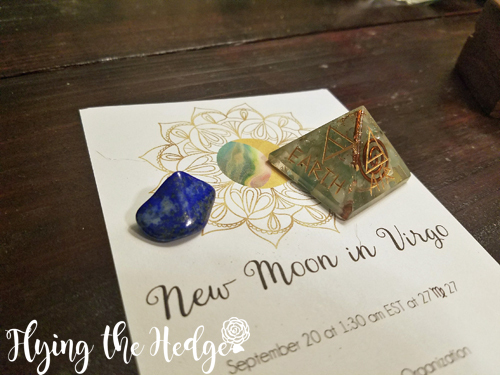 Finally I opened up the crystals: a lapis lazuli and an amazonite orgone pyramid. The lapis lazuli is stunning. I have been looking at purchasing some, but was excited when it arrived in my Nova Luna box. 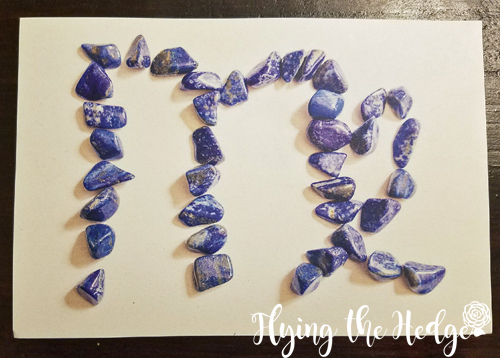 Lapis lazuli is great for boosting confidence, something I have needed in wake of my divorce. The amazonite orgone pyramid is engraved with the elements on each side. I really like this feature as it allows it to be used for a variety of purposes, not just directing energy. Amazonite is associated with intuition and intellect, while the orgone portion is said to be able to remove stagnant and negative energy. 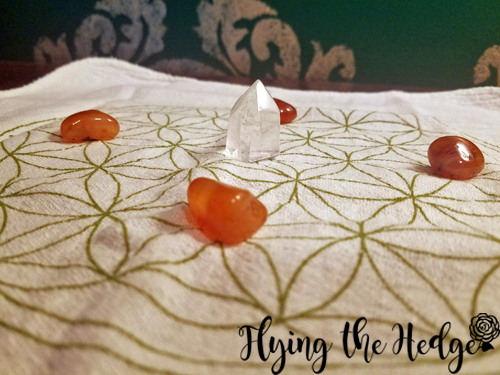 I used the pyramid during my ritual to hedge ride to increase my intuition during soul retrieval and to rid myself of old wounds. Overall this was a useful box with some great tools to celebrate the New Moon. Based on the listed prices, I received just over the value of the box. 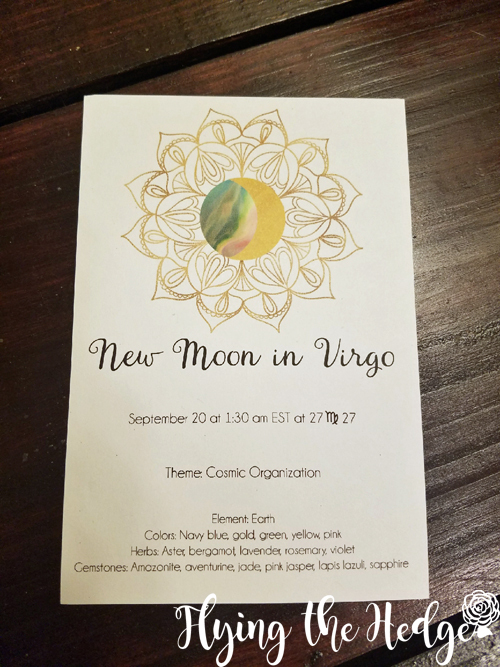 The fact that I was able to use all of the items the night of the New Moon was fantastic. The box is consistent. 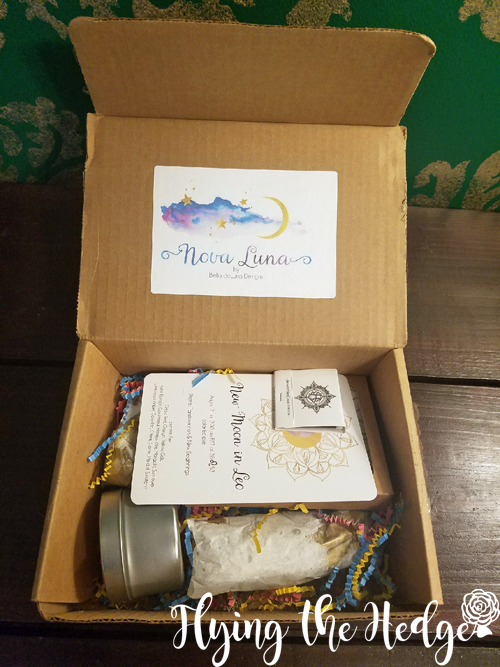 It always comes with and information card containing a breakdown of the cost of each item, a monthly candle, a crystal, and 2-3 other ritual items. The information card is informative, but incomplete. It explains how much each item costs an usually how to use the items in your monthly ritual. The information card is incomplete. Unfortunately there is no mention of where the items came from. In fact, every single time I had to do the research myself. I don't like not knowing where the items came from and what businesses I am supporting. The box is pricey. At $38 a box, this is one of the most expensive boxes I have purchased. 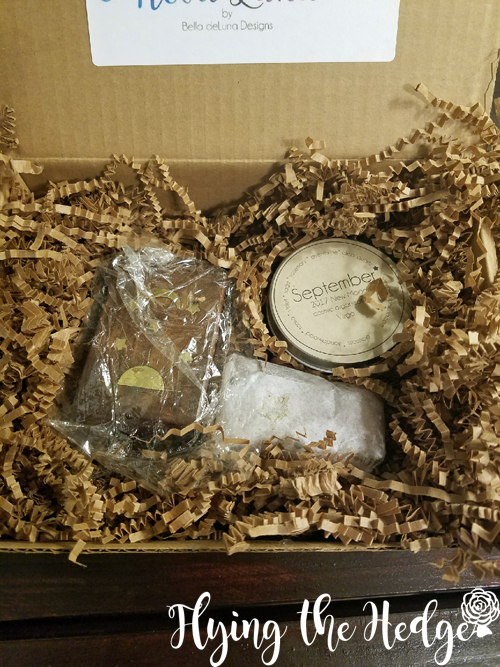 While I have enjoyed each box, I have received more items for less in other past subscription boxes. For many, $38 a month is out of the budget. I know it is for me! There is a lot of packaging and it is not eco-friendly. The paper and cardboard box can be recycled, but the bubble wrap can not. This post is only how many weeks late? That's okay though; sometimes life gets in the way. 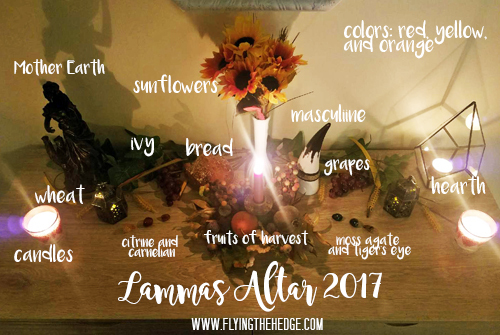 Lammas or Lughnasadh is the first of the harvest festivals, specifically celebrating the harvesting of wheat. 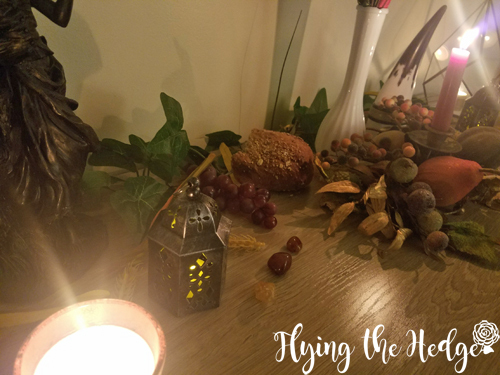 Because of this, I centered my altar around wheat and the first fruits of the harvest, as well as reds and yellows to represent the still powerful sun. On the left I have my ever-standing representation of the feminine aspect, the Earth. She is where all our food is harvested from, making her the perfect addition to this sabbat's altar. Next to her is a loaf of bread, representing abundance and new growth. Bread is also a customary dish for Lammas, which translates to loaf mass, as wheat is the number one crop harvested during this time. 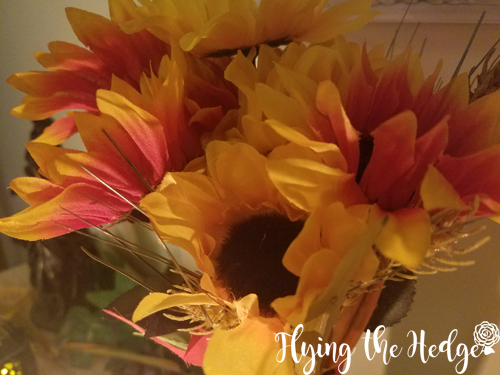 In the center is a bouquet of sunflowers in yellows and oranges mixed with wheat. Sunflowers represent the sun, balance, and fertility. Mixed in with the sunflowers is wheat, the crop harvested at this time, which symbolizes fertility as well. 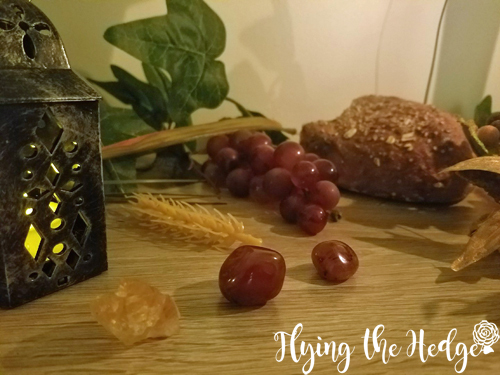 Furthermore, wheat also represents abundance and charity, as Lammas is a time to celebrate with others and give back to our communities. Next to the flowers is my horn, representing the masculine aspect, specifically the sun, as well as fertility. In front of the flowers is a centerpiece of fruits and fall leaves with a red candle in the center. These fruits represent the fruits of the first harvest, fertility, abundance, and prosperity. 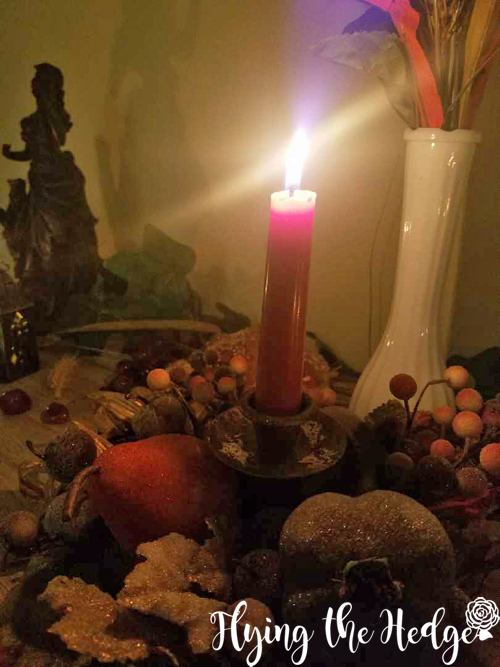 The red candle symbolizes the Sun and masculine energy that aids in the ripening of said fruits. On either side of the center piece are several crystals. 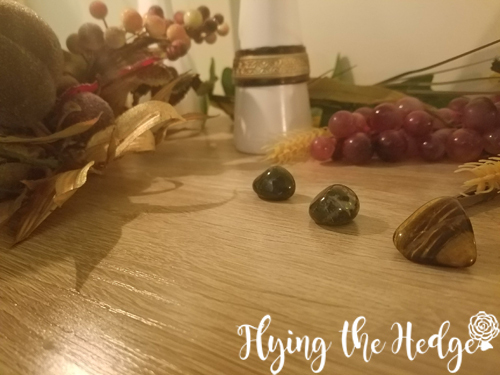 On the left are two carnelian crystals representing the sun, citrine for prosperity, moss agate for fertility and abundance, and tiger's eye for abundance and prosperity. 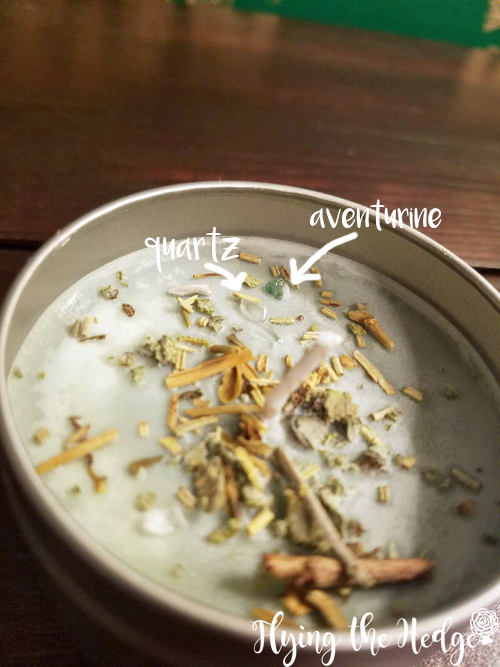 At the very end of my altar in my terrarium is salt and a candle. This combination represents the hearth where bread is baked and consumed. It also represents the element Fire and Earth which combine to produce the food we eat during this harvest festival. Draped around the back of the altar is a vine of ivy, representing abundance, grapes, representing fertility and abundance, and wheat, representing fertility. Spread throughout the altar are several candles and lanterns representing the sun and light which still predominates this time and helps ripen fruit, vegetables, and grains. The Sun is particularly important during this festival in combination with the Earth as they work together to produce a bountiful crop prior to winter. 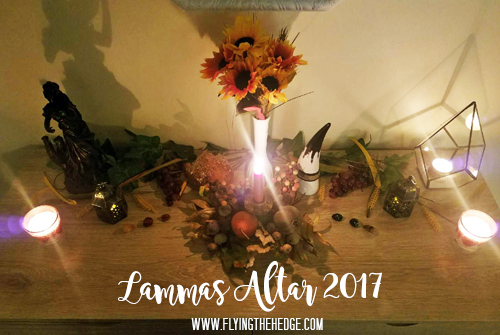 I hope everyone had a wonderful Lammas. I honestly missed it, but hopefully next year will be better. 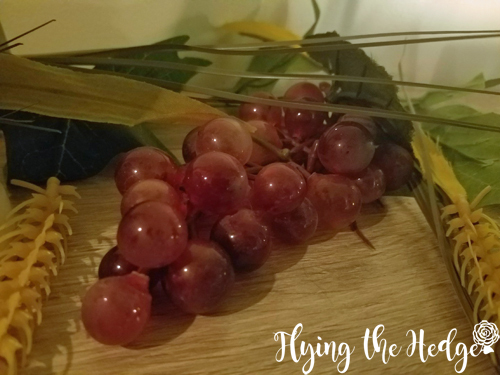 I am taking time to be thankful for what I do have, and sometimes that means putting some things, however important, on hold for a short period. I hope everyone enjoys the rest of the summer as it wanes and fall comes upon us. 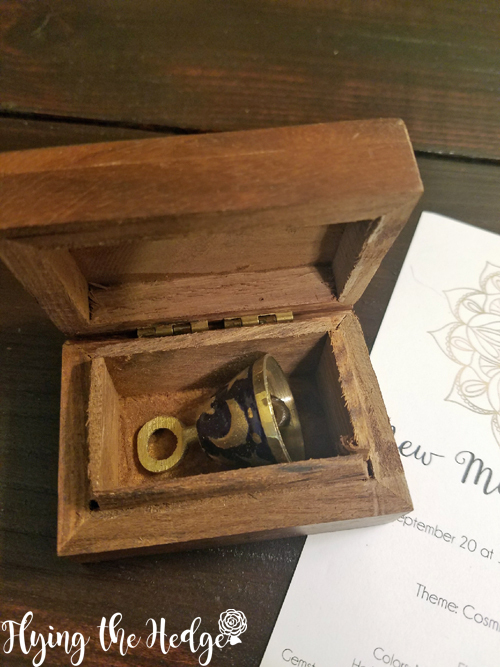 Last month one of the best things to happen to me was receiving this little box of joy. 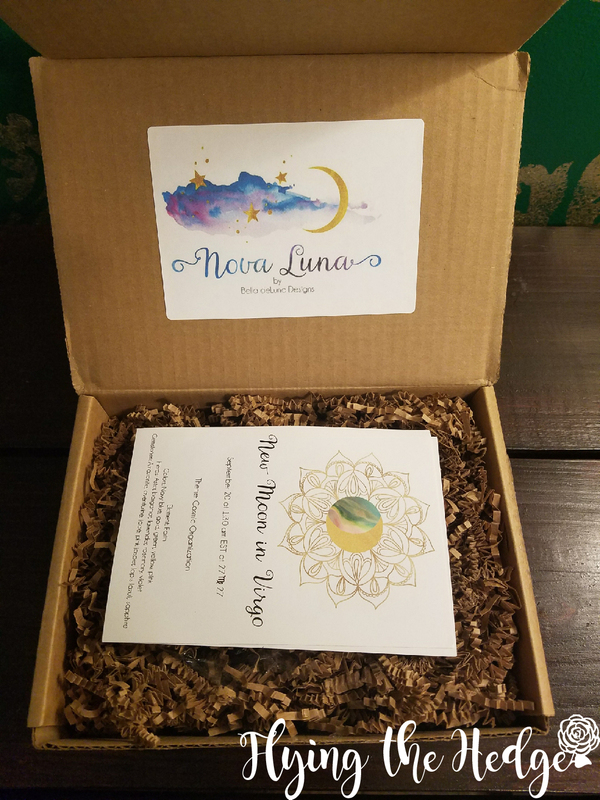 Unfortunately I didn't do anything for the New Moon last month, but I am still thrilled with the box of goodies I received and will use them in future rituals. Upon opening this box, I noticed some things were different. This time instead of a letter I received a card with all the of the information I needed. This card was much nicer than the letter from the month before, showing that the creators of this box are evolving. It was beautifully designed and well-organized. 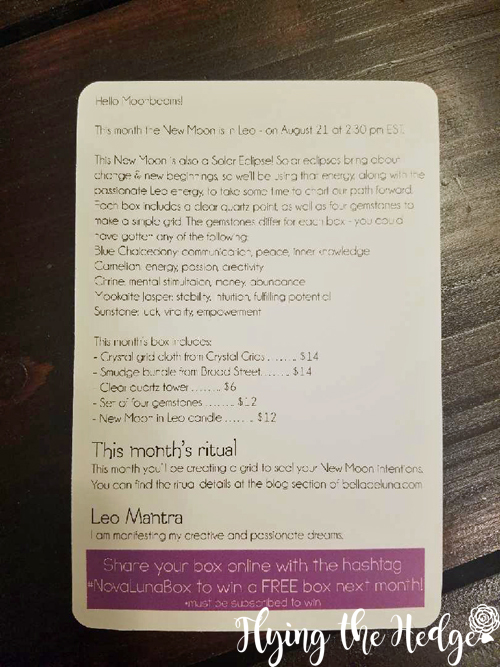 The front of the card gave the correspondences for the New Moon in Leo while the back explained a little bit about the New Moon and the solar eclipse, the contents of the box, including prices, a New Moon mantra, and where to find ritual ideas on their blog. Next I withdrew the candle. 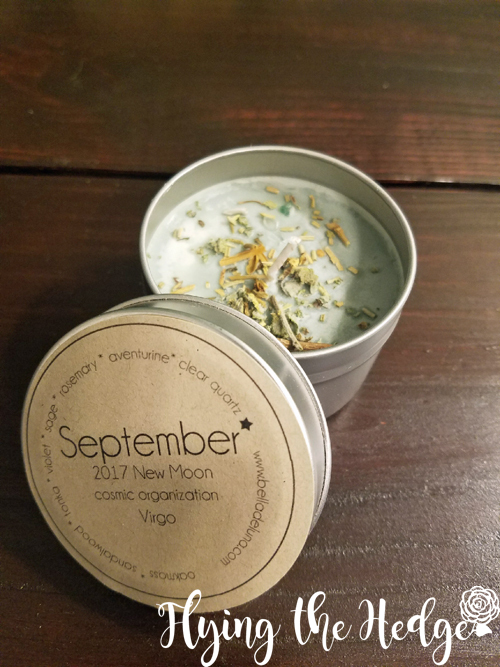 This month's candle smelled of roses, sage, violet, damiana, honeysuckle, and jasmine. When burned, the candle smells mostly of roses and filled my entire house with the smell of early summer and love. Embedded in the top were pieces of onyx and clear quartz for amplify and aid in transformation and new beginnings. 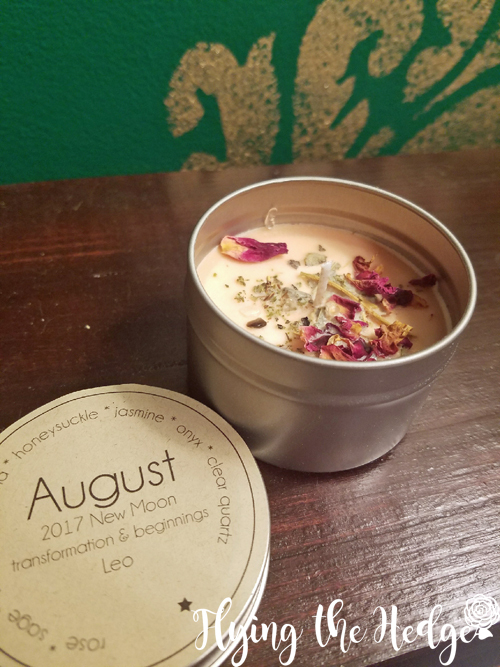 Wrapped up in beautiful celestial tissue paper next to the candle was an herb bundle from Broad Street Collective. 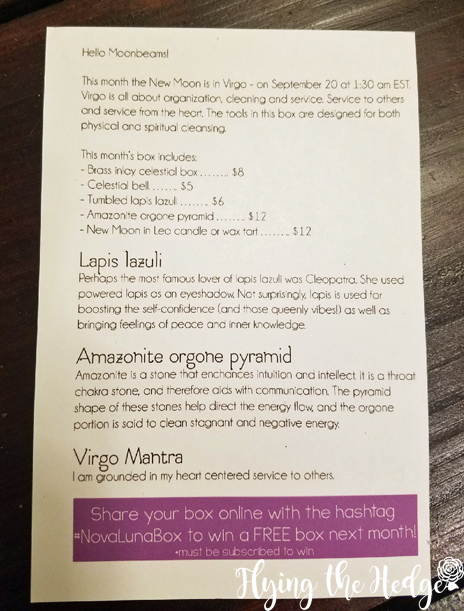 There is no mention on the card which herbs are included, but after doing a bit of research I found the bundle contained cedar, sage, and rose. From looking at it, I believe it may also contain lemon grass. While it smells amazing prior to being burned and looks nice, it doesn't smell too pleasant when burned. 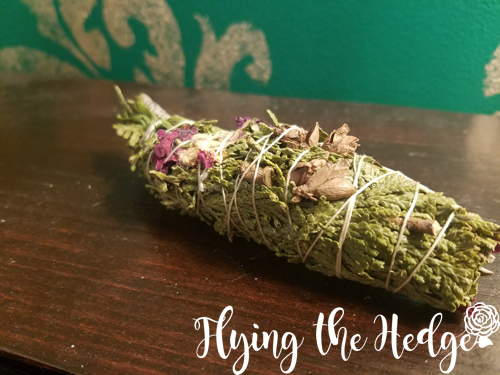 Furthermore, it doesn't want to smoulder as other herb bundles typically do. This will be a toss-in-the-fire type of bundle for future use. 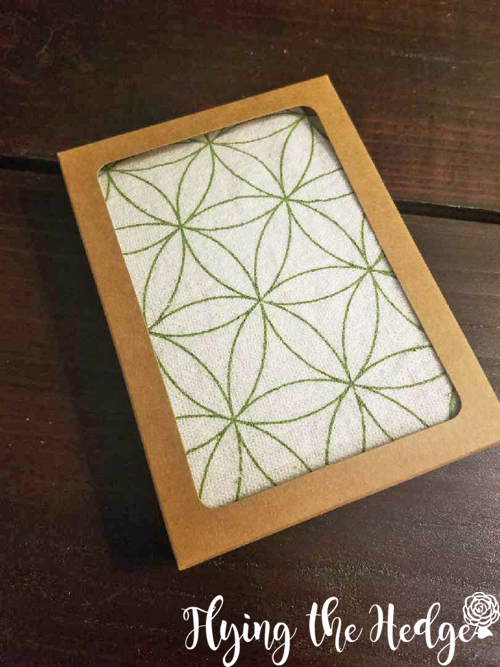 With the herb bundle came a pack of matches. I have to say, as a witch obsessed with candles and smoke, you can never had too many matches! Underneath every thing was probably my favorite item, a cloth crystal grid from Crystal Grids. I have been researching crystal grids and have even been thinking about designing my own wooden ones to sell. This was a pleasant surprise and a sign that I need to continue down this path. 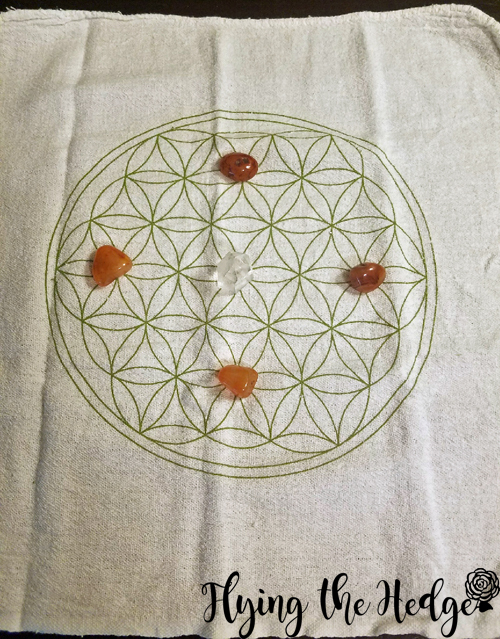 Accompanying the crystal grid was a clear quartz tower and 4 carnelian crystals. Unfortunately I had to figure out on my own which of the stones I had. 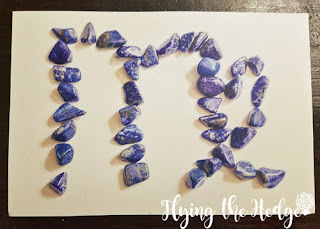 The card mentions I could have received any of the following: Blue Chalcedony, Carnelian, Citrine, Mookaite Jasper, or Sunstone. 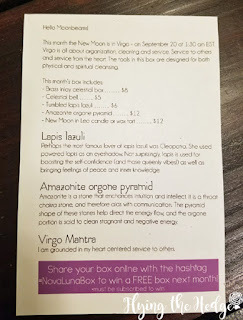 I have to say, I am disappointed I did not receive blue chalcedony or mookaite jasper. However, to the untrained witch, carnelian, citrine, and sunstone all look very similar, which could lead to confusion. It would be been nice if the card had indicated which crystals I received or if the creators had limited it to a one crystal option. The quartz crystal tower is quite stunning and makes a marvelous centerpiece for the crystal grid. Overall, I am pleased with this month's box, with few exceptions. I look forward to seeing what next month holds for me. 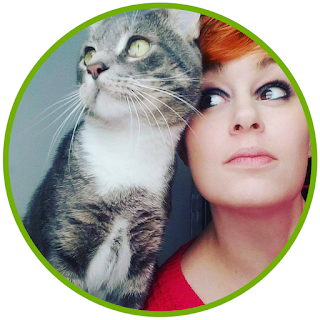 Looking for a subscription box, but don't know where to start? 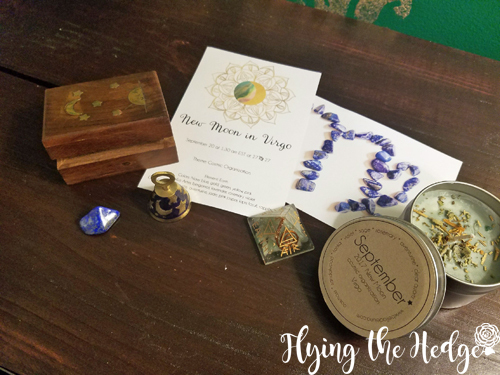 Read my other pagan subscription box reviews and check out Cratejoy to see what boxes catch your eye!